Wild Fan - These freaky eyes might make you look like a freak but the purple and white spiral color makes them look breathtaking. You will be the star of the show with these violet fan contacts. Search for our username: cococontacts on instagram so you can see what is new and check out fun images. 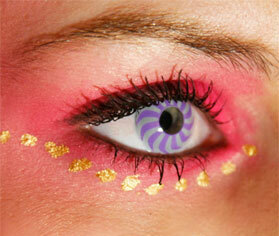 Look like the most beautifully unusual fairy with Coco Contact’s Wild Fan lenses. With a combination of lavender and white, just imagine how it would look with made up eyelids to give you the appearance of a mythical creature. Get your pair now only at cococontacts.com.